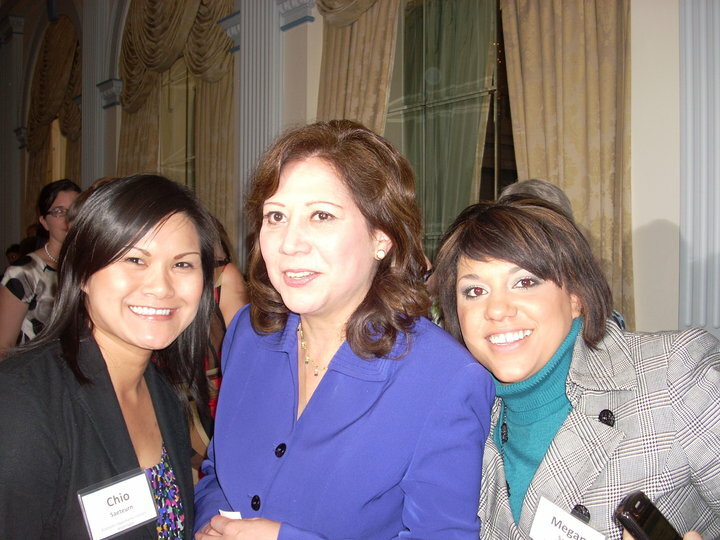 From left to right: Chio Saeteurn, EOI Intern; Hilda Solis, U.S. Secretary of Labor; Megan Sacks, Healthy Tacoma Coalition. A group of Washington citizens are just back from a jam-packed 2-day trip to “the other Washington” led by the Economic Opportunity Institute’s Marilyn Watkins, where they urged members of the state’s Congressional delegation to take action on paid family leave and paid sick days. In meetings with with their legislators, Megan and other “citizen delegates” urged their representatives to: 1) approve the Healthy Families Act, which would guarantee seven paid sick days per year for workers at businesses with 15 or more employees, and 2) pass new federal funding proposed in President Obama’s budget to cover state paid family leave program start-up costs — while ensuring that Washington State is eligible to receive those funds, up to $10 million per year for three years. The trip, part of a national effort sponsored by the National Partnership for Women and Families and the Family Values at Work Multi-state Consortium, brought citizens from across the country to Washington, DC to speak with their representatives about the importance of paid sick days and paid family leave for American working families. Attendees from Washington State met with Rep. Jay Inslee, Rep. Brian Baird and Rep. Norm Dicks, as well as staff from the offices of Sen. Patty Murray, Sen. Maria Cantwell, Rep. Norm Dicks, Rep. Adam Smith, and Rep. Jim McDermott. They also participated in a series of forums and workshops designed to share ideas and experiences for broadening coalitions, engaging citizens and business leaders in campaigns, telling effective stories, and other keys to successfully advancing new workplace policies. Participants included: Megan Sacks (Healthy Tacoma Coalition), Sharon Ness (United Food and Commercial Workers Union), Nathe Lawver (Pierce County Central Labor Council, Healthy Tacoma Coalition), Lily Wilson-Codega (Seattle Coalition for a Healthy Workforce), Marilyn Watkins (Economic Opportunity Institute), Joshua Welter (Washington CAN, Main Street Alliance), Janet Chung (Legal Voice), Masha Burina (Seattle Womens’ Commission), Chio Saeteurn (Economic Opportunity Institute), and Selena Allen (Washington Family Leave Coalition).